Matsuri slot immediately conjured an image in my head of the name given to a discounted electrical item you might find in the supermarket, for those that can't quite afford the Samsung Fridge or Panasonic TV. However, the word has a much more important meaning, used commonly to describe a Japanese festival. There are several good Japanese-themed games about, among them Netent's Koi Princess and Novomatic's Katana thus there could be cause for optimism here - so have Play'n Go developed a slot as good as the Japanese name suggests, or do we have mediocrity hiding behind this ceremony? We begin with 25 pay lines on the standard 5x3 layout and naturally the symbolism is Japanese along with the obligatory Oriental pipes and drums soundtrack as you spin the reels. The reels are set over a spectacular backdrop of a harbour at night with an aerial firework display and lanterns on the houses along the seafront which forms a very pleasant scene. There are various foods consumed at the Matsuri, such as sushi, dumplings and cakes along with ceremonial flowers and fans and they make an appearance on the reels. 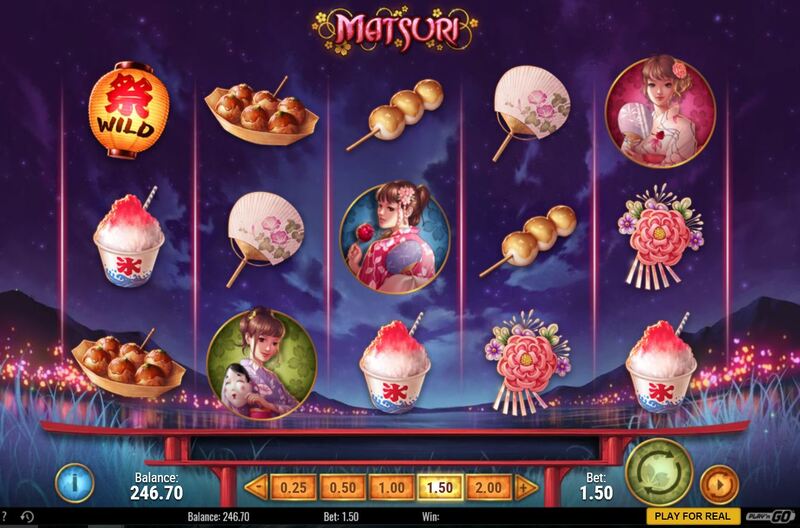 The premium icons are 3 different young Geisha girls in traditional dress of which pay 14, 12 and 10x stake respectively for 5-of-a-kind and the scale ends at the lowest sushi and rice dumpling icons which both pay 2x bet. There are Wilds in the form of yellow lanterns on all reels and like all the other symbols these occur singly and have no multiplier attached but do pay a nice 40x bet for 5-of-a-kind. There are no random in-play features but we do get 2 different scatters to trigger their respective bonus games. The first bonus is triggered by 3 Goldfish icons on reels 2, 3 and 4. This is quite appropriate as the feature is named after a traditional Matsuri children's game called Kingyo Sukui. Children get a scoop made of rice paper which naturally crumbles in water and must try and catch as many Goldfish from the pool as they can before the fish fall through the paper. So you pick Goldfish and transfer them to a different tank of water, hoping they don't fall through and end the bonus. You get cash values for each one successfully transferred and the maximum pay is a mighty 500x bet! For this feature you need to land 3 Feline Festival Masks on reels 1, 3 and 5. You begin with 8 free rounds and no retrigger, but you do get 2 extra spins for each Festival Mask that lands. The enhancement is an expanding transferring Wild. Any Wild lantern that lands will expand into a full-reel Lantern Banner which pays any wins then moves one reel left for the next spin until it disappears, essentially the same as the Wilds which appear in Netent's Jack And The Beanstalk's free games. 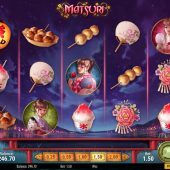 So if you land a Wild on all 5 reels you would get Matsuri's maximum pay of 1000x stake (25x40) and would get another huge pay on the next spin as the first 4 reels would remain Wild!